Innovation, the conversion of the new to business as usual, is a very special business process. It is the business process able to reprogram all others. Creating the practices that make this process work is a key challenge for all in financial services that are worried about responding to the future. When an institution can identify things that are outside its present practices and convert them, production line style, into products, processes, cultural changes, or new markets, it will never be outpaced by internal or external change again. The institution becomes «FutureProof». This is a book about those practices in banks. It explains, using examples from institutions around the world, what it takes to create an innovation culture that consistently introduces new things into undifferentiated markets and internal cultures. It shows how banks can leverage the power of the new to establish unexpected revenue lines, or make old ones grow. And it provides advice on the social and political factors that either help or hinder the germination of the new in banks. 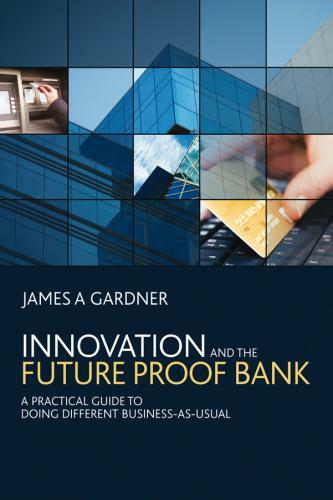 Moreover, though, this is a book about the science of innovation in a banking context. Drawing from practices already highly developed in financial services—managing portfolios of assets to mitigate risk—it explains how practitioners can run their innovations groups like any other business line in the bank one that delivers a return on investment predictably and at high multiples of internal cost of capital. For leaders, Innovation and the Future Proof Bank provides the diagnostic tools to guide benchmarking and investment decisions for the innovation function. And for innovation practitioners, the book lays out everything needed to make sure that converting the new to business as usual is predictable, measurable, and profitable.